I recently looked at the historical Investment Returns of Equities and Bonds. But there are of course many other asset classes which you can throw your money at. So I thought I would take a look at another option which you may have considered or be considering - Residential Property. Some people swear by it, some people swear at it! You have all been round that braai when Uncle Pete says "You know when I bought my house 15 years ago I paid R200 000, and now it is worth R1.5million - property is the best investment!" (Of course no one ever seems to tell the story of how they bought Satrix 40 ETF units for R7.50 back in 2000 and now they are worth around R46 each - I guess that story is not as exciting or glamorous, and will probably need more explaining because most people do not know/couldn't be bothered to find out how the Equity Market works). So to better equip you for the next braai that Uncle Pete is at, I thought I would start looking at Residential Property as an investment. Quick Disclaimer - I do own an apartment which I rent out in Sandton. I figured it might not be a bad refresher to run some numbers again. 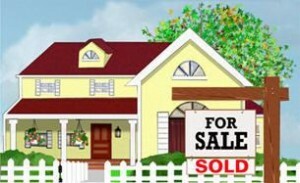 As a starting point, in this post I will only consider the capital growth of residential property (i.e. house price growth). I plan to run some full Buy To Let Investment scenario's in a future post. But to get the ball rolling I will start by laying down some of the groundwork. 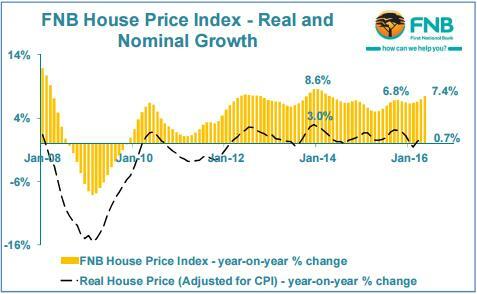 So what has house price growth been like in South Africa? I managed to dig up a 2014 article on Moneyweb which gave the average annual house price growth after inflation (i.e. real growth) since 1966 as 0.9%. The problem I had with this was that there were no sources or calculations given to back it up. So it's a starting point but I was not convinced. 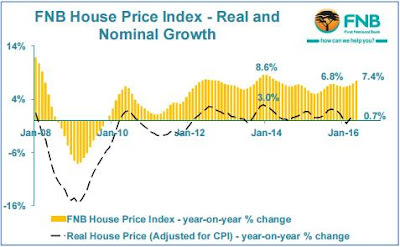 Fortunately ABSA release a house price index report once a month, and even more fortunately for me the good people at ABSA gave me some historical data as well. So I used the last 10 or so years of house price index growth to get an estimate for what the capital appreciation of property has been. (I understand that this not fully representative but I am using it to get an estimation). This is not far off from the Moneyweb article estimation. Call me bias, but I prefer my number - probably because I calculated it myself. FNB also publishes a similar report on a monthly basis the latest of which can be found over here1. I managed to pull the below graph out of the report. The ABSA figures given above are for homes of 80-100 square meters. I could not find what the FNB index is based on but I suspect it is probably houses of all sizes. The chart is a nice graphical representation of the FNB numbers, but you cannot accurately calculate any long term averages from it. I asked FNB for the underlying data but I did not get a reply, so all we are left with is the picture. You can see the black dashed line (representing the annual house price change in real terms) sort of hovers around the 0 line, except for the years immediately after the 2008 financial crisis where there was some serious negative growth. So from this it seems that the ABSA (and Moneyweb) number is probably about right. It's a pity about the lack of numbers from FNB because now, due to lack of competing information, I am forced to use the ABSA number. So going forward when running scenarios which require house price growth, I will use 0.6% real growth. Far from a perfect science, but it will have to do as a starting point. Of course some areas will do better and some will do worse than this, and those with success in property investing will generally do better than this because they probably have more of an "eye" for picking well priced properties in good areas. And of course what you end up paying sets the starting value of your returns and can make a big difference to what sort of growth you will get. But for a general case I will use the number I calculated - 0.6% Real Return per year. I will add Real House Price Growth of 0.6% to my SW Numbers Page for future reference. If you have read this far and find my posts interesting, why not follow me on Twitter? I enjoy the interaction and hearing your thoughts. I will also tweet when I have a new blog post for you to read, or when random thoughts pop into my head. I also want to start throwing out questions to hear what you have to say! 1 Makes for 25 pages of chunky reading, but they do have some interesting charts - for example the Western and Eastern Cape are currently leading the other provinces in house price growth. Also it seems that Electricity and Water costs are increasing above inflation while general maintenance and repairs are actually getting cheaper.